With the Wii U launch window approaching its close and Nintendo turning attentions to boosting sales, Nintendo of America is lining up a new hardware bundle to hit stores in the U.S. and Canada on 17th February. 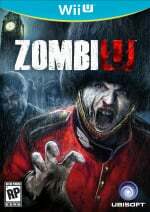 The ZombiU Deluxe Set is notably picking up on the bundle previously exclusive to Europe, but with some additions. As the name suggests, this is the black 32GB model, so it'll include the usual goodies such as stands and access to the Digital Deluxe Promotion for eShop purchases. Like its EU counterpart it'll include a copy of ZombiU alongside a Wii U Pro Controller, but will also feature a ZombiU collectible booklet (with artwork and developer commentary) and a download copy of Nintendo Land to pick up from the eShop. Considering the extras included, its price of $389.99 compares favourably to the $349.99 Deluxe Set; Nintendo has stated that it offers a saving of $70 over buying all of the items separately. While the words "price cut" are off the table for now, it seems that Nintendo is looking to offer bundles and incentives instead. Is this a package that any of you in North America are interested in picking up? If I didn't have one already, I would totally get this! Great deal! Hopefully it will boost Wii U sales. Thats a pretty cool deal. I'd like to take a peek of that booklet. NOw if this was offered for NA on launch day than I would have got this bundle. We need a Monster Hunder Bundle in March! Ooooh .. this looks awesome bundle ! Probably a bit too late for this. Maybe it will convince some people to buy it, it's a nice deal and all. But really should have been there the day the game was released. I wish this came out at launch. I would of so get this if I didn't already get one at launch date. Awell I have no regrets. I agree, also add a 3DS XL bundle. While I have no interest in the game, the Pro Controller would have made it worth it to me. 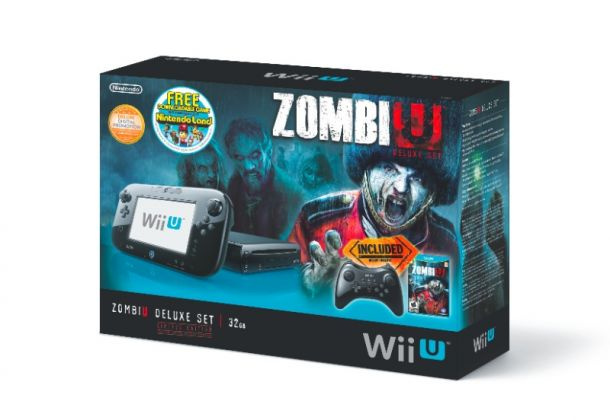 It's the same price as the Deluxe bundle plus a Pro Controller, with ZombiU and a booklet added for free. While I would have liked to see Nintendo Land in disc form here, this is a terrific deal. Glad to see Nintendo trying bundles to push sales. Awesome! More people will get to play the awesome game that is ZombiU! Not to mention this is a damn good deal....if only I had waited I could've saved 20 bucks on ZombiU and got a pro controller to boot! See? We're already starting to forget everything about Rayman and Ubisoft. Definitely would've gotten this if it was available at launch. 40 dolars for Zombi U and a pro controller only with the loss of the physical copy of nintendo land is great. i definitely gonna get this bundle and finally a WII U!!!! This bundle makes me wish I waited until now to buy my wiiU. Although this is kind of a no brainer. (BRAINS!! lol zombie joke.) At least someone over at Nintendo is staying late after hours to come up with ideas to sell this product. I don't see this as a big system seller this far from launch, even if Nintendo is still referring to it as the "launch window." If people really wanted to play ZombieU they probably would have purchased this by now. And having this bundle just gives even more reason for the Basic and non-ZombieU Deluxe consoles to remain sitting on store shelves taking up space. On the bright side - this package deal w/ Pikmin 3 instead of ZombieU would probably get me to buy 1. Nice move. I particularly like how it is going after the core gamer. Even if it sits on shelves it sends a message, but it's a good deal to boot. Makes the backstabbing by Ubisoft in regards to Rayman Legends a bit nastier given this deal, though, doesn't it? It would have been worth it if ZombiU was a good game. I don't think I will get it, but I totally would! Also, in order for SEGA to finally start selling big on the Genesis, they had to pack in Sonic 1, and eventually Sonic 2, so I think Nintendo is getting the right idea. Pack in Super Mario or Zelda: WW HD in a Wii U bundle...yeah, they are packing-in some super software sellers, but they'll sell a crap-load of Wii U systems! That's so not fair. I want that, instead I bought it early. And it only came with Nintendo land. This is a good move, downplay that Nintendoland. But the price is still too high. That's bloody good! I want an art book! mine was 350 euro's = 467,81 U.S. dollars with only Nintendoland, yes unfair, but im used to it, see this all the time. I still don't get why the original Zombi U bundle retailed for 420 (!!!!) euros in Europe (420 euros ~ 560 $). nintendo land great pick up and play game and zombiu is a lot better than the reviews said about it.it has plenty of scares and ive only played about 5 hours.great package it like mine just add mario and yer laughing. This is a good deal. I would have gotten this if I already hadn't of. Comes with a Pro controller even, very nice! This is great! Now that the precedent's been set, they can follow it up with a game that I actually want. Should have done this at the Wii U launch. I would have bought this bundle instead of Nintendo Land which I never play. They should have released this before Ubisoft totally bungled the rayman legends release . Yay im so happy!!!!!!!!!!!!!!!!!!!!!!!!!!!! i saved 220 for one and my parents are probably gonna split the rest!!!!!!!!!!!!!!! I am interested, too bad that interest came 4 months too late. If they would have been smart this would have been launch material. Awesome deal I purchased all this at launch , the pro-controler itself is $60.00 - MAN if I only would of had patience LOL . Looks interesting but the price not so much. Great pack. Two games and an extra controller. I have my Wii U but it is a great pack. If my tax return ends up being what I think it will be I was considering using part of it to buy a Wii U. What good timing for this bundle! Nintendo really doesn't want to sell their Basic systems I guess. Maybe with the way the Deluxe sold they realize the way to go is to bundle lots of extras to entice people into making the plunge, so now they're just going to keep coming up with ever more deluxe sets to avoid a price drop. With Nintendo land and the artwork booklet as a bonus, this doesn't sound like a bad bundle! 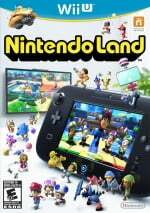 I would have prefered a physical copy of Nintendo land instead of a download, but you can't have everything! But I'll wait! I am sure the price will go down and maybe even better bundles will surface! It's a good deal, but it isn't enough to change my mind about buying the console and I doubt it will many others. If it was, say, around $249 I would be interested, but I don't care what they throw in this box - I'm not paying $400 for a Nintendo console. Actually, it's $10 cheaper than buying the console and controller separately. All of the next consoles should be $250. I wouldn't buy a Microsoft or Sony console for $400. @Koto I don't so much mind paying more for either a Sony or Microsoft console - I use them everyday for multimedia purposes, but I don't do this with Nintendo's consoles. @Koto PlayStation and Xbox also do something amazing that Nintendo seems to hate doing: releasing new games -_-. Seriously, the Wii U is new and it's so far cramed with over priced ports, the next game you guys have to look forward to is a remade port of a Wii game!!! Don't get me wrong, I would like a Wii U, but so far, there's nothing there. Man its a good thing i waited! Damn! I should've waited for this version. Looks like a good bundle it basically. Comes with 3 or 2 games and the pro controller... A must buy for me. @hydeks MH3U isn't a remade Wii port of there pal, its a remade port of a 3DS game thank you very much. But seriously its as much a remade port as a Pokemon game is, especially since only Japan got MHP3rd and thats where a good chunk of the improvements came from. This is a pretty good deal as far as value is concerned, assuming your interested in ZombieU or the pro controller that is. Not interested but hopefully it helps boost sales. Hopefully, it'll help Nintendo. I'm still waiting to see if Batman 3 would be available to Wii U. That could be my turning point to get a Wii U console..
@bluecat: This is exactly what I plan on doing. With the economy and downsizing of my paycheck, I've not been able to afford either a Wii U or 3DS. That is all about to change on Feb 17 (or after, if my refund comes in later than that, but its supposed to be direct deposited before Feb 25). My daughters love my plan as well. I'm going to get this ZombiU Wii U deluxe bundle...and pass my older Wii on to them in their room. I am also going to pick up a 3DS XL...and MH3U for the Wii U and 3DS pre-orders. MH3 on the Wii has been one of my favorite games on the Wii...and being able to carry my save back and forth between the two...at home and on the road...is going to be great. Come on, tax refund and Feb 17!!! @nathanbjohnson It's like Nintendo's way to demonstrate how you get you users on a console to Ubisoft. I imagine Iwata petting Guillermot saying "This is how it's done, you little prick..."